I got this gorgeous velvet peplum on an incredible sale at J.Crew Factory right after Christmas. It's available online, but the J.Crew version is available at a total steal at under $20. J.Crew keeps running % off deals on top of that too. Today it is an additional 50% off $14.99 with code SALETIME and available in all sizes. I mean they are practically paying you to take it home! At that price I am seriously considering adding the white or black color to my shopping cart. The only difference from the one I have is that it has a v-neck. Before I purchased this top I had to take a moment and think about how I could wear it for winter. I always try and think of different ways I can wear something before buying it to make sure it is versatile enough. With a sleeveless version like this there are several ways to remix it. 1. Add a blazer over top. Velvet is a thick material and this top is fully lined so adding a cardigan over top could result in a lumpy looking mess. A blazer is structured enough that everything would look smooth. I almost added a navy or khaki blazer with this outfit! 2. Layer a turtleneck underneath. Adding some color or a print to your outfit by layering a thin turtleneck underneath your sleeveless peplum top. It keeps you warm and adds interest! 3. Wear a button up underneath. The beauty of a thicker material is that it layers over other tops nicely. You can change it up by adding a collared button up underneath and wearing it like a vest. Don't forget to add some statement jewelry! I love the richness of velvet and how a statement necklace looks against it! 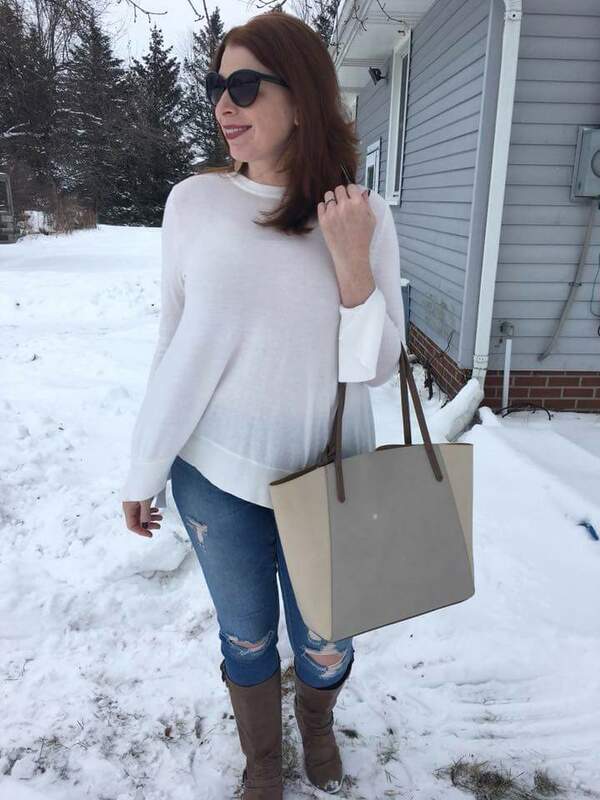 Last week's most popular post was from Jaymie at Shop Your Closet with her pretty ivory sweater! 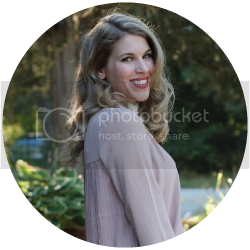 That blue velvet is so pretty on you and the statement necklace looks stunning! Super sale on that peplum, sometimes it does seem like the store is paying you to take it home, lol! I love how you wore this top! Sometimes I forget there are other ways to wear sleeveless tops in winter than under a blazer or cardigan! Laura, that is a great top! I am loving cobalt blue on you and what a genius way to style a sleeveless velvet top for winter. And the leopard shoes are perfect! I adore leopard and cobalt together. So rich and sassy and chic. This peplum top is the cutest, love the colour and how you layered it!! I never to thought to layer like this while a sleeveless top. Thanks for tip and oh the possibilities that I can see in my own closet. 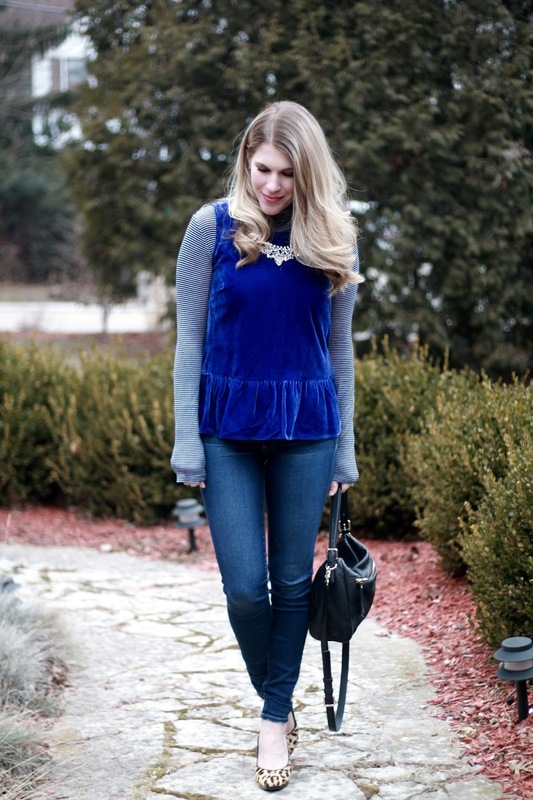 In love with the peplum velvet top! The color is so pretty Laura! Thanks so much for the link up. Oh what a beautiful velvet top! :) I have a black peplum tank and seeing this has made me realise I've never layered anything under it - what a wasted opportunity! I'll need to see if I kept my striped long sleeve tops when I unearth my winter clothes from their boxes later this year! 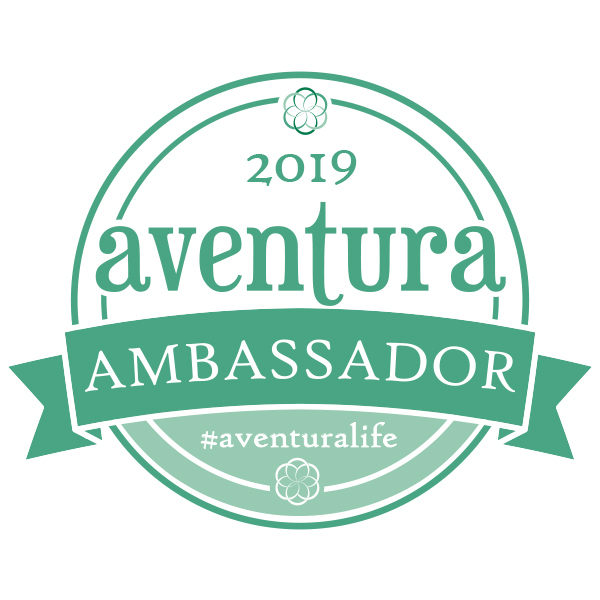 Thank you for the link up too! You look gorgeous in blue! And what a great idea to layer this top with a long slleve shirt for colder weather! This peplum is gorgeous!! Love the color and how you layered it. Beautiful look Laura! This is such a cute layering idea! Love the pretty velvet! Such a pretty top! I love it styled with that statement necklace too! You layered this perfectly Laura!! It almost looks like the striped shirt is part of the velvet one!! And that color on you is spectactular!! I am just in love with this velvet piece, I have never seen anything like it! All of those ways will look great for layering! The color is so pretty. I love how you paired it with a thin striped shirt and leopard shoes! What a cute peplum top, and I'm loving how you layered it with the stripes. Such a great idea! Love this idea! And that royal blue colour looks great on you! Love this vibrant blue on you Laura! Wow, it looks styled like a vest and i love this way of layering. Beautiful way to show off your necklace! I love how you layered this top! 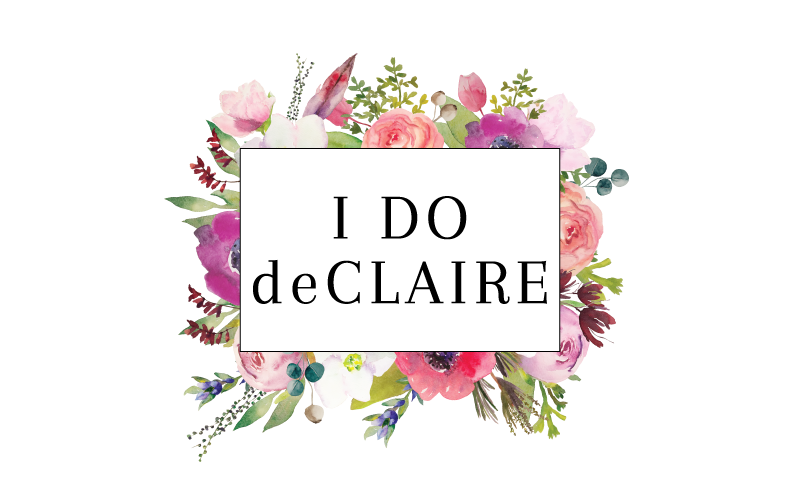 It's great to be able to keep spring and summer items rotating throughout the year in your closet. This shade of blue looks gorgeous on you and I love the texture of this velvet! This blue velvet number is so good, doll- love that bright cobalt! This velvet peplum top is gorgeous! The cobalt blue is so striking and looks great against the stripes. The blues look great with leopard. Great layering. I love that pretty velvet! Very clever layering ! You pull it off so well Laura. I love the layering, it looks like it belongs together! I love the velvet it's such a pretty color. Your peplum top is gorgeous. The color is so lovely and I love how you styled with a stripes long sleeves. Perfect together! This Blue is the BEST shade on you. So vibrant and wow, how I love the peplum. Velvet is my love these days and I totally love your styling. That velvet top is super cute dear! The color is perfect on you, and truly makes that statement necklace shine! Such a beautiful top Laura, I love the colour! I never thought to layer a peplum top - I tend to avoid them because they don't sit right on me with having a long torso. I'll have to try this! Thanks for linking up! 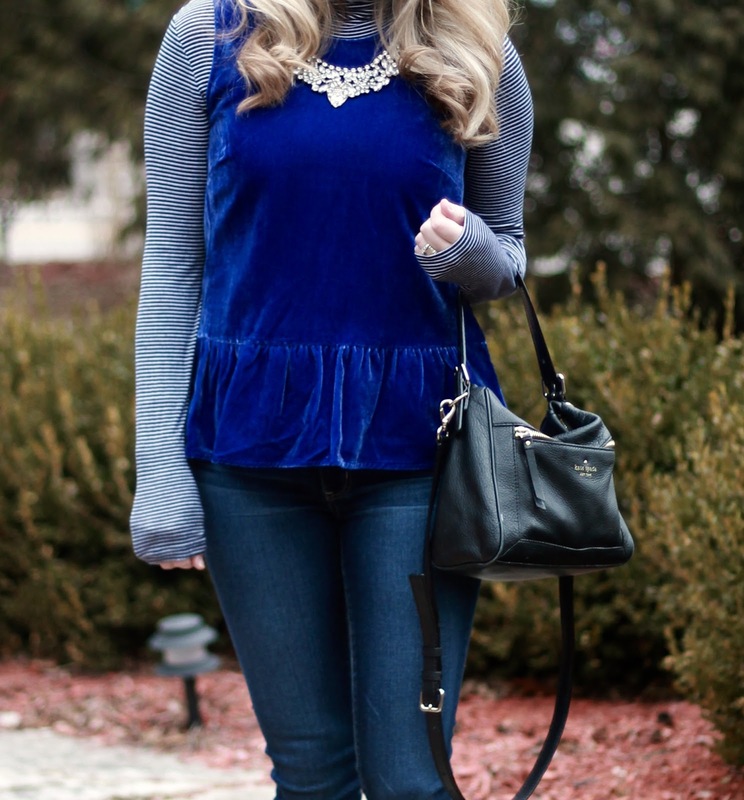 Love the velvet peplum top! I usually layer mine with just a plain black top. This gives me another idea! Thanks for the link up! I love that pretty blue peplum top! 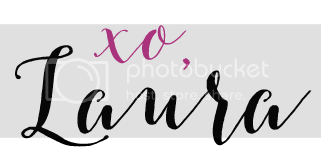 I've been thinking I really need to add some velvet into my closet so I may have to check out that sale! love that blue on you!!!! 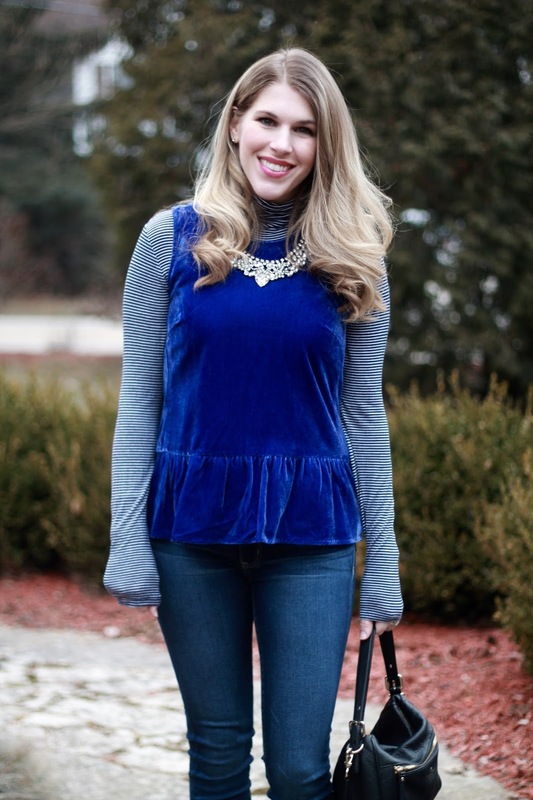 Such a great velvet top! So beautiful! I wounder, if you were to wear this velvet shirt without a long sleeve underneath, do you think it would irritate your underarms? I am in LOVE with this look, but I'm not sure if it's cold enough in Southern California for this many layers. Would you wear the velvet without an undershirt ? It's very soft so I could definitely wear it without an undershirt. I am looking forward to trying it in spring! 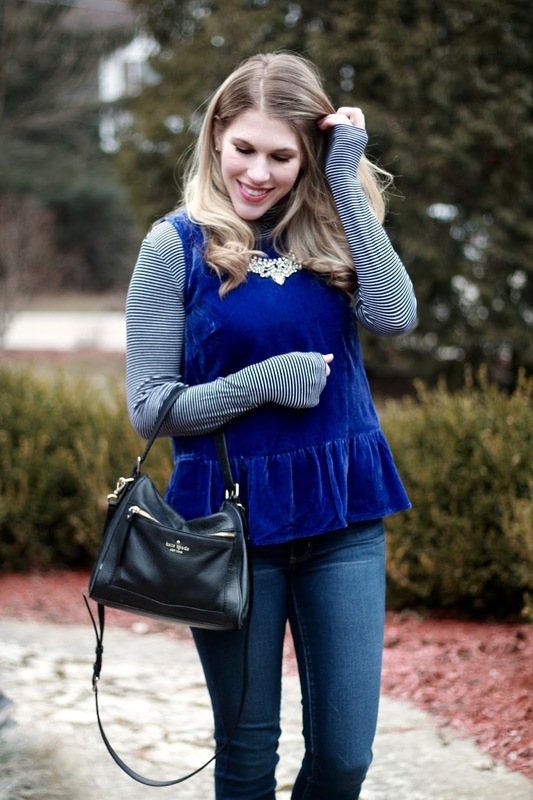 I love how you layered this velvet peplum top! It looks so soft and cozy!